As professional firework display organisers we stage professional fireworks displays for weddings, parties and corporate events. Whatever you are celebrating, wherever you are celebrating, we’re here to help. As double winners of the British Fireworks Championship we’re licensed to thrill! There is almost no situation we haven’t already experienced. Whether it’s a star-studded party in the Maldives, a Bonfire Night show on the village green or celebrating a loved one’s life by sending their ashes up in fireworks, we’re all fired up to do it. We can even put on a show at 24 hours’ notice! And if noise is a problem our quiet fireworks are guaranteed to keep the peace! 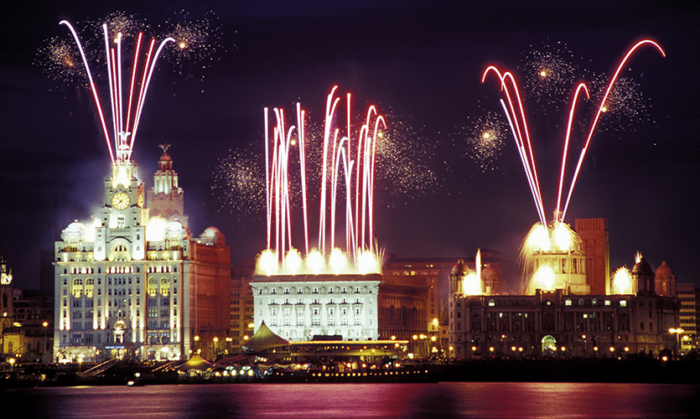 Every one of our firework displays is a work of art, like the one pictured here on Liverpool’s waterfront. We have spent the last 30 years honing our skills, polishing our creative flair and painting the sky with art in action. We like to think that our displays are also the result of a lifetime. Well 30 years anyway! We make organising your display easy. We take care of everything, from site survey to risk assessment and notifications, so you can get on with everything else. On the day we’ll arrive in good time, set up the display and remain discreetly in the background until firing time. Afterwards we’ll clear up and leave quietly. In many case we’ll even come back the following morning to make sure your venue is left as tidy as when we arrived.